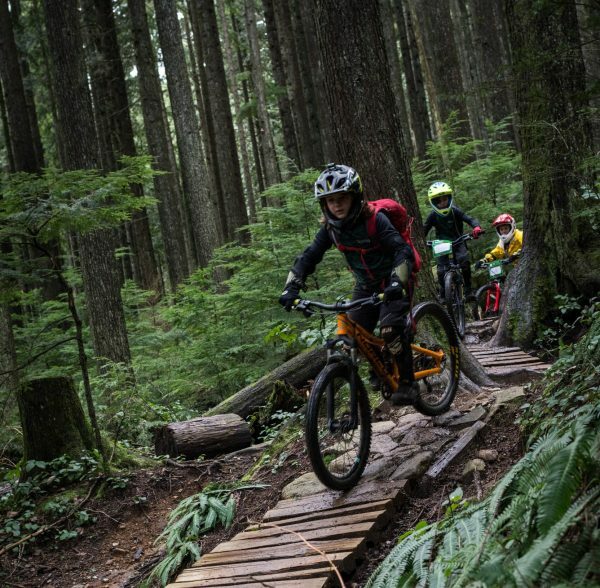 Conquer the legendary trails on Fromme and Seymour Mountains. Shred with the Escape Team Coaches who have grown up riding these trails. Spend time exploring trails, sessioning TTFs (technical trail features), reading lines, practicing skinnies, ladders, drops, wall rides, and everything else The Shore has to offer. Trails to be explored range from Bobsled, Floppy Bunny, Expresso, Crinkum’ Crankum, and Seventh Secret on Fromme to the Seymour Mountain trails such as Corkscrew, Asian Adonis, John Deere, Pingu and Pangor. This is to name only a few – there are so many more!! All Extreme Riders will be assessed on day 1 and placed into appropriate skill groups. As the week progresses, and your Extreme Riders’ skills progress, your rider may be moved between skill levels. To be riding in Extreme Riders, you have to have some experience with TTFs, riding steep up and down hills, skinnies, ladders, drops and wall rides. We will continue to build your skills and confidence in these areas. Riders will have the opportunity to give back to their trails by spending time involved in trail maintenance through the NSMBA Youth Stewardship Program. In both 2017 and 2018, our riders gave 370+ hours of time working on the trails. Brent Hillier, NSMBA Trail Builder and DNV Permit Holder on Upper & Lower Griffen, provides excellent instruction and guidance. The obvious: bike, helmet and armour. The not so obvious, a spare tube, snack, lunch (no nuts please) and water, in a back pack, to be carried by the rider. Go to the very top of Mountain Hwy. Pass through the yellow gate and follow the gravel road to the water towers for drop off. Mushroom Parking lot is 5 km up the road to Mt. Seymour ski area. Take Mount Seymour Parkway and head North at Mount Seymour Rd. Watch your odometer for 5 km and turn right into the Picnic Area parking lot. Riders will be coming up the dirt trail from Lynn Creek. This will save you driving down Mountain Hwy, through the traffic, to pick them up.